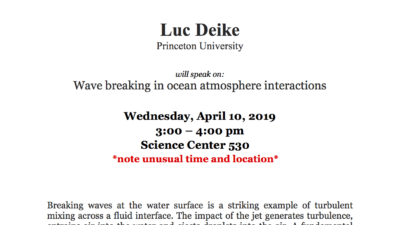 In the Spring 2019 Semester, the Center of Mathematical Sciences and Applications will be hosting a seminar on Fluid Dynamics. The seminar will take place on Wednesdays from 3:00-4:00pm in CMSA G10. Abstract: Piezoelectric material has drawn enormous attention in recent decades due to its ability to convert mechanical deformation energy into electrical potential energy, and vice versa. It has been applied to both energy harvesting and passive vibration control applications. In this talk, we will discuss the effect of piezoelectric material on the stability of a flexible flag using a fully coupled fluid-solid-electric model. An inviscid vortex-sheet model and a linear electro-mechanical model are combined to describe the problem. We find that the critical flutter speed is increased due to the extra damping effect of piezoelectric material, and can also be altered by tuning the output inductance-resistance circuit. Optimal resistances and inductances are found that either maximize or minimize the flutter speed. The former application is useful for vibration control while the latter is important for energy harvesting. Abstract: Numerous efforts have been devoted to the derivation of equations describing the kinematics of finite-size spherical particles in arbitrary fluid flows. These approaches rely on asymptotic arguments to obtain a description of the particle motion in terms of a slow manifold. We present a novel approach that results in kinematic models with unprecedented accuracy compared with traditional methods. We apply a recently developed machine learning framework that relies on (i) an imperfect model, obtained through analytical arguments, and (ii) a long short-term memory (LSTM) recurrent neural network. The latter learns the mismatch between the analytical model and the exact velocity of the finite-size particle as a function of the fluid velocity that the particle has encountered along its trajectory. We show that training the model for one flow is sufficient to generate accurate predictions for any other arbitrary flow field, capturing the spectrum of the particle velocity, as well as the extreme event statistics. The proposed scheme paves the way for machine learning kinematic models for bubbles and aerosols using high-fidelity DNS simulations and experiments. Abstract: We present a probabilistic deep learning methodology that enables the construction of predictive data-driven surrogates for stochastic systems. Leveraging recent advances in variational inference, we put forth a scalable computational framework for discovering surrogate models from paired input-output observations of a system that may be stochastic in nature, originate from different information sources of variable fidelity, or be corrupted by complex noise processes. We also show how physical constraints can be employed as informative priors that introduce a regularization mechanism for effectively constructing robust deep learning models in cases where the cost of data acquisition is high and training data-sets are typically small. 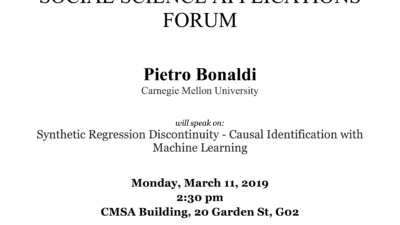 The effectiveness of the proposed methods is demonstrated through a series of canonical studies involving stochastic dynamical systems and nonlinear conservation laws. Abstract: Conventional computational methods often create a dilemma for fluid–structure interaction problems. Typically, solids are simulated using a Lagrangian approach with grid that moves with the material, whereas fluids are simulated using an Eulerian approach with a fixed spatial grid, requiring some type of interfacial coupling between the two different perspectives. Here, a fully Eulerian method for simulating structures immersed in a fluid will be presented. By introducing a reference map variable to model finite-deformation constitutive relations in the structures on the same grid as the fluid, the interfacial coupling problem is highly simplified. The method is particularly well suited for simulating soft, highly-deformable materials and many-body contact problems, and several examples will be presented. This is joint work with Ken Kamrin (MIT). Abstract: Breaking waves at the water surface is a striking example of turbulent mixing across a fluid interface. The impact of the jet generates turbulence, entrains air into the water and ejects droplets into the air. A fundamental understanding of the general multi-scale properties of the resulting air-water turbulent flow is necessary to develop more accurate gas transfer or spray generation parameterizations. I will discuss a multi-scale approach where air entrainment, bubble statistics and aerosol generation by bubble bursting is investigated by laboratory experiments and numerical simulations at small scale while ocean scale fluxes are obtained by up-scaling the results using statistical description of the wave and wave breaking field. This approach leads to semi-empirical formulations to be implemented in coupled ocean-wave models. Abstract: A grand challenge with great opportunities is to develop a coherent framework that enables blending conservation laws, physical principles, and/or phenomenological behaviors expressed by differential equations with the vast data sets available in many fields of engineering, science, and technology. At the intersection of probabilistic machine learning, deep learning, and scientific computations, this work is pursuing the overall vision to establish promising new directions for harnessing the long-standing developments of classical methods in applied mathematics and mathematical physics to design learning machines with the ability to operate in complex domains without requiring large quantities of data. To materialize this vision, this work is exploring two complementary directions: (1) designing data-efficient learning machines capable of leveraging the underlying laws of physics, expressed by time dependent and non-linear differential equations, to extract patterns from high-dimensional data generated from experiments, and (2) designing novel numerical algorithms that can seamlessly blend equations and noisy multi-fidelity data, infer latent quantities of interest (e.g., the solution to a differential equation), and naturally quantify uncertainty in computations. The latter is aligned in spirit with the emerging field of probabilistic numerics.